This baked pasta consist of flaked crab meat, cream of mushroom soup, milk and grated cheese as the main ingredients. This is a simple dish compared to other baked pasta and can be prepared and served in any occasions. One advantage of cooking this seafood pasta is it does not contain red meat or poultry so I’m sure this is a healthy alternative to the usual meat based pasta. 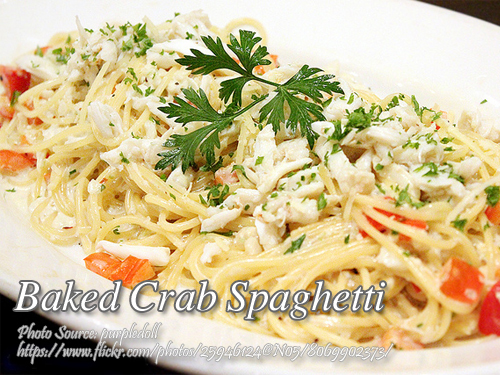 To cook crab meat white spaghetti; Cook spaghetti according to package directions. Drain and fill the pot with tap water then drain again. Set aside. Heat the soup and keep stirring until smooth. Add the butter and milk and stir cook to combine. Remove from heat and stir in grated cheese. Stir again to combine. Mix the milk-cheese mixture with spaghetti, crab meat and season with salt, pepper and MSG to taste. Place in a shallow greased casserole and sprinkle with the remaining cheese. Bake on a 350°F, pre-heated oven for 15 minutes or until cheese melts. To see the complete recipe, continue reading. Cook spaghetti according to package directions. Just in case the cooking direction is missing, cook the spaghetti in boiling water with a teaspoon of salt and cooking oil until the pasta is tender and firm (al dente). Drain and fill the pot with tap water then drain again. Set aside. Heat the soup and keep stirring until smooth. Add the butter and milk and stir cook to combine. Remove from heat and stir in grated cheese. Stir again to combine. Mix the milk-cheese mixture with spaghetti, crab meat and season with salt, pepper and MSG to taste. Place in a shallow greased casserole and sprinkle with the remaining cheese. Bake on a 350°F, pre-heated oven for 15 minutes or until cheese melts.